Wildlife and ancient ruins are an everyday scene, at The Ranthambore Tiger Reserve, Rajasthan. Here is a quick guide to plan a safari trip, you will never forget. A ruling kingdom is still present, as the fort ruins are sanctuaries for the majestic tiger other wildlife. The silence of the jungle was broken by the distant call of the sambar deer - a warning for approaching danger; the forest naturalist raised his eyebrows and we took the cue to become silent. After moments of silence, we spotted her. The majestic tigress was perched on a hill slope, staring at us with inquisitive intent. She walked towards our jeep in slow regal strides while we stayed still. Hardly a few feet away, I studied her anatomy in awe and fear. Her striped coat, and intimidating snout gave me chills; her steps were light and her amber-eyed gaze drifted past us as she walked towards a pond close by. Forty minutes passed unnoticed, we were mesmerized by her poise and nonchalant behaviour. Suddenly, she stared into the distance, and hunched her shoulders. We realized that a sambar deer was unwittingly heading towards the pond. Crouching with the perfect posture, she camouflaged herself well. In a split second, the deer made the realization and galloped away; the tigress did not seem to fuss and resumed her leisure dip in the pond. This tigress was 2 and a half years old, making her a princess with a year to mature into a queen. Lovingly named Lightening, by the forest department, it was my second sighting of her in 3 days. On the first safari outing we followed her on a hunt where she ripped a spotted deer apart, with ease. Hence, it was only natural that her presence at close quarters turned me into a bundle of nerves. Earlier that morning, we had spotted her brother named Pacman by the Rajbagh lake, feasting on a soft shell turtle. A majestic beast whose mere size turned his jungle surroundings into miniature proportions; his choice of prey was rare making it an extraordinary sighting. I counted my stars for spotting the elusive big cat, but the chances were based on luck and strategy. Summers are the best time to spot wildlife, in other words brace yourself for a three hour safari ride, in the sweltering heat. The Ramthambore Tiger Reserve is a three hour drive from Jaipur, located in Sawai Madhopur. Summer and winter turn this deciduous forest into a dry and open landscape making spotting wildlife far easier between November to February, and April to June. The area is divided into zones numbered 1 - 10, each roughly marking the territory of its resident tigers. It is a game of numbers, mazes, pug marks and decoding animal calls - so that is where your luck fits in. Visitors are allowed in the morning and afternoon only, with the transport options of canters and jeeps. While jeeps can slip and slide across the ravines and steep inclinations, canters are the next best option as both vehicles stick to the same route. 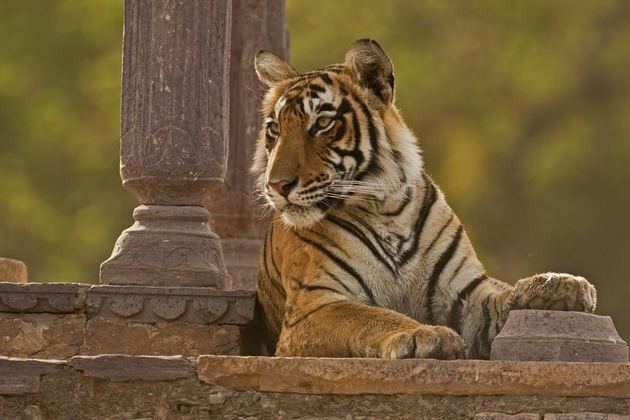 The face of Ranthambore Tiger Reserve is the queen tigress Machali, who is respected and revered. Responsible for aiding the population of tigers, Machali has raised 9 cubs, who have carried on the lineage of the Royal Bengal Tiger. Locals narrated her memorable sightings, the most popular was her battle with a 10-foot long crocodile - the ending was not fortunate for the crocodile. Forest officials trace her whenever they can - but it is certain, Machali has a loyal following. 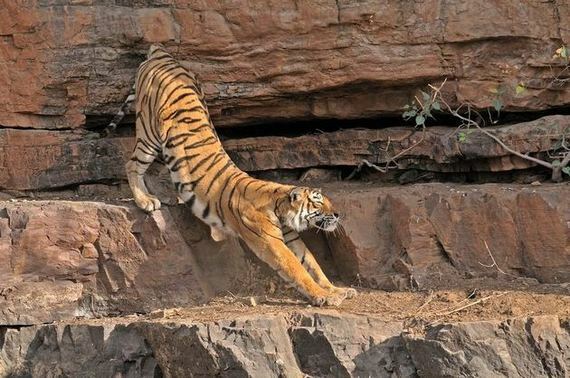 Machali, the mighty tigress poses with finesse even when she stretches. Over the past century, India's efforts to conserve the big cat has improved, showing a steep incline in tiger population. Although the numbers are higher in regions such as the Western Ghats and Sunderbans, Ranthambore is a favourite due to the higher chances of tiger-spotting, in a smaller area. From the moment you enter Ranthambore Reserve, it feels like another world. The temperature drops due to the rich foliage; the steep hill ranges merge with the dry grass lands, water bodies and lofty greenery. Peacocks display their feathers, gazelles and spotted deer graze peacefully as playful langurs munch on mango leaves. Along the hill tops you will spot The Ranthambore Fort, a UNSECO world heritage site which is open to viewing should you have the gusto to trek all the way up. As you drive through the forest check posts, you will enter carved gateways and mini forts that have succumbed to creepers, banyan trees and flora. The guides share stories of how leopards and tigers were spotted within these ruins, making the sight almost a work of fiction. Even though the big cats deserve their due, Ranthambore is about the experience to relive nature and history at its best. 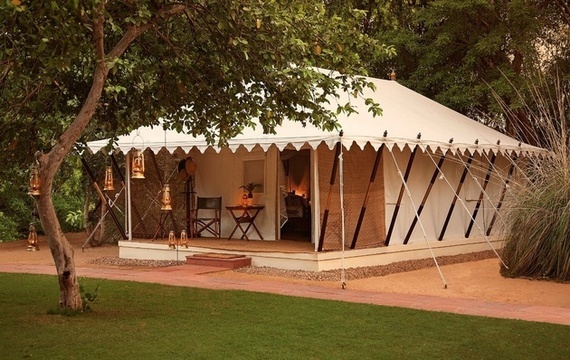 The beautiful Sher Bagh Relais & Chateaux, has been the glamping destination for many years. Most of urban Sawai Madhopur is a single stretch of lodges, hotels and campsites on the fringe of the Tiger Reserve. Ranthambore Bagh, is a beautiful resort with comfortable rooms, tents and buffet style meals. Run by founder Aditya Singh, an avid wildlife photographer backed by his attentive team, this is residence of choice for naturalists and wildlife media crew. A lush garden backyard, bird watchers need not go far to spot more than 150 varieties, that are said to visit Ranthambore Bagh. 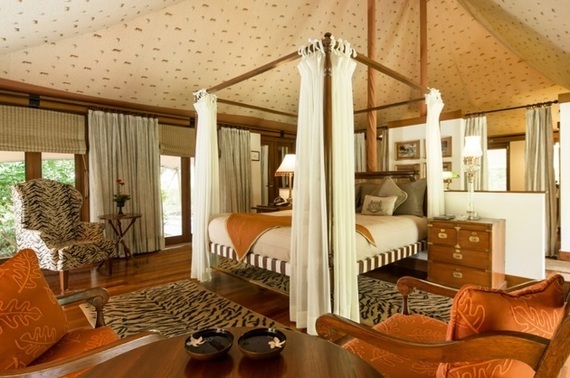 For an added dose of safari luxury - try glamping (glamour camping) at The Oberoi Vanyavilas, Sher Bagh or Aman-i-Khás. The Oberoi Vanyavilas has a spectacular observatory tower overlooking the reserve, for you to catch the sunset over the rolling landscapes of Ranthambore. Luxury tents have private pebbled gardens with the safari theme running through every detail, such as the tiger motifs on the tented roof.